Sept 5-13 Just 4 Seats Left! We begin our tour in Salt Lake City at 10:00 AM by meeting at the Little America Hotel Downtown. Once all are accounted for, we will have a tour of Salt Lake City, visit historic Mormon Temple Square and then have a welcome dinner. Later that evening, we will attend a rehearsal of the Mormon Tabernacle Choir. We will stay at the Little America Hotel Downtown. We will arrive in the world famous town of Jackson Hole by mid-afternoon. After getting check into the hotel we will make our way to downtown for dinner. Today we will begin the day with a smooth water float trip on the Snake River. Afterward, we will have lunch in Jackson, and there will be some time to explore the downtown area get a picture under the unique elk antler arches (don’t worry no elk were harmed) and visit some of the local shops. That afternoon we will take a gondola ride to the top of the Jackson Hole resort. We will ascend 2,000 feet to the top of the mountain and have an amazing view of the Grand Teton and the valley below. We enter Grand Tetons National Park. Jenny lake sits at the base of the Tetons. We will take a boat ride on Jenny Lake for a fun and scenic experience. After lunch, we visit the Jackson Lake Lodge, which is a great place to sit and enjoy the great outdoors. The vistas of the Teton Mountain Range are just fantastic. We continue on into Yellowstone National Park and plan on heading directly to Old Faithful Geyser and Inn. We will see geyser that has made Yellowstone so famous, tour the Inn and then head for West Yellowstone for dinner and lodging. We visit the nearby Grizzly Bear and Wolf where we will see a well-done exhibit of live Grizzly Bears and Wolfs. We then continue back into Yellowstone to see the Fire River, Geyser Basin and the parts of Yellowstone known for its geysers and wildlife, and then return to West Yellowstone for the evening. 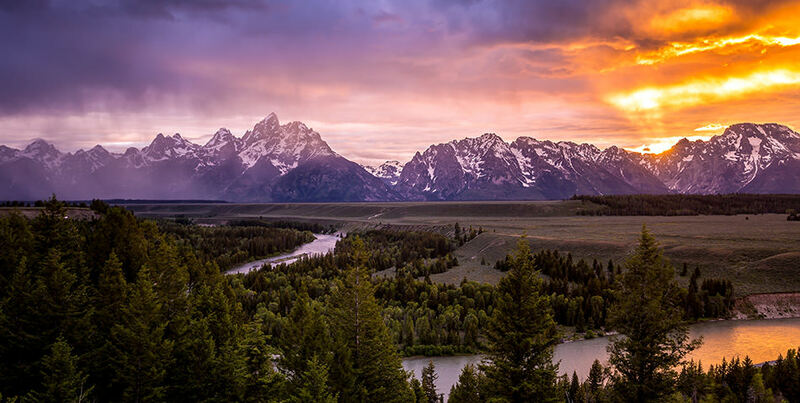 Today we want to visit the Yellowstone River and the famous “Grand Canyon of the Yellowstone” and travel along Yellowstone Lake on our way to Cody, Wyoming. In the afternoon, we will visit the world famous Buffalo Bill Museum for some outstanding displays of the Plains Indian teepee and lifestyle; thousands of guns that were used in developing the American Wes; and many artifacts related to Buffalo Bill. Dinner and lodging will be in Cody WY. We have an optional evening activity for those who want to visit the Buffalo Bill Museum in Cody. Breakfast is at Bubba’s (wait until you see the size of the biscuits and pancakes) we then drive over the Big Horn Mountains and have lunch in Sheridan WY. We will see coal deposits in Gillette on out way to Devil’s Tower. 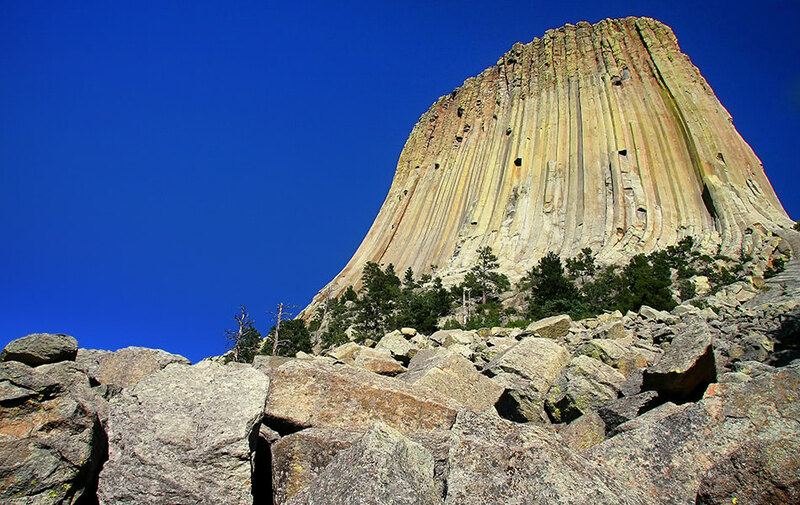 Devil’s tower was named America’s first National Monument. We arrive in Deadwood City late afternoon for check-in, dinner and gambling if you are so inclined. After Breakfast we take the Deadwood Boothill Tour. After lunch in Deadwood we travel through the beautiful hills of Blackhills South Dakota and take an extensive tour of famous Mt Rushmore. We visit the Crazy horse Memorial and view it at a distance. Lodging and dinner will be in Hill City, South Dakota. We take a morning tour of the Badlands located near the Sioux Indian Reservation and then visit famous Wall Drugs for lunch and shopping. Afterwards, we will return to Rapid City for departures from the airport. If you choose to return to Salt Lake with the guide we will need to book an additional hotel room in Casper, WY the night of day 9. We would then return to Salt Lake the following day, arriving at about 4:00 pm, in the afternoon. There is an additional cost for the hotel but not for the return trip.